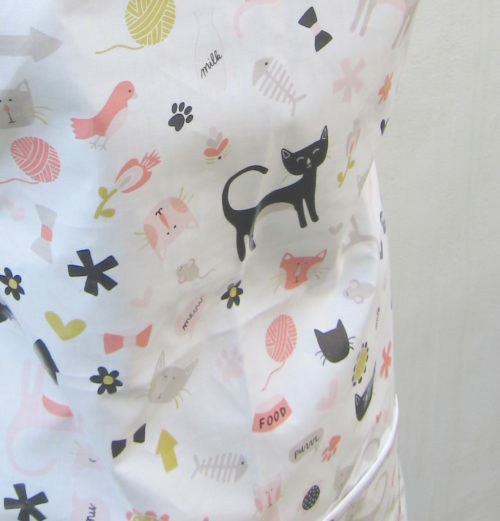 Full length apron in cats print. Cute and practical gift idea. Waterproof and machine washable laminated cotton. Features adjustable strap and front double pocket. Fabric is lightweight and soft to wear. Great for cooking, baking, gardening , crafts , cleaning and more. Apron handmade from laminated cotton. Printed front of apron is smooth and waterproof. Inside of apron is soft cotton. Easy to clean. Wipe with a damp cloth or machine wash.
One size fits most. Adjusts to fit your height.